wet dreams about drum machines, you're not alone sad boy...girl!? 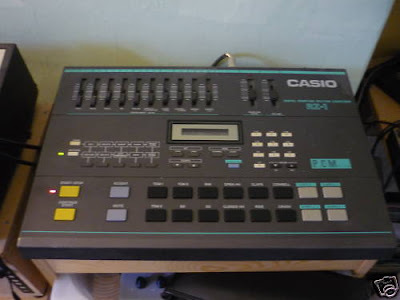 CASIO RZ1 Vintage Sampling....for sale! There's everything you'd expect on a drum machine - pads for all the sounds, a pattern sequencer and mixer for each individual drum. For a Casio it's surprisingly well equipped with extras - there's individual outs for all the channels, as well as full MIDI connections. The main selling point is the primitive 80s drum sounds and the sampling function, which has the same trashy 8-bit sound as the SK1 keyboard. It may be of interest to circuit benders too. It's fully functional and in good nick, no original box but it does have a manual which was kindly printed out by the person I bought it off originally. CLICK HERE TO BID ON THIS ITEM! ROLAND TR707 Vintage...for sale....BARGAIN buy it now! 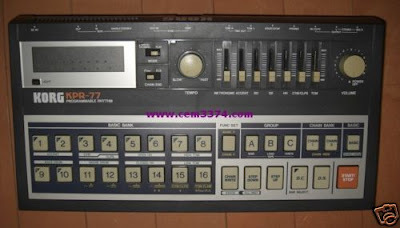 Roland TR 707 vintage drum machine.This is in very good condition comes with power supply and manual pdf. 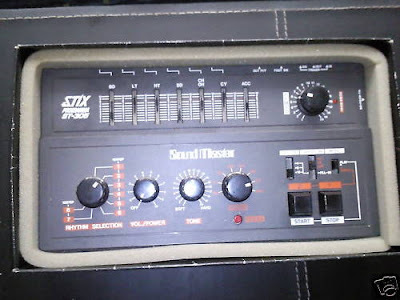 VINTAGE SOUNDMASTER Stix Programma ST305...for sale! 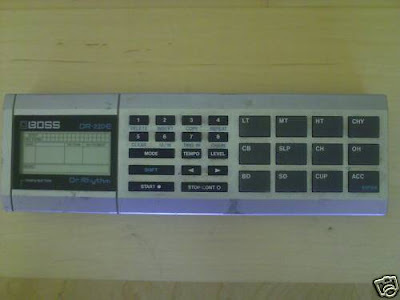 Computer Rhythm drum machine, Supplied with its original box and Operating manual. Features include: fill and variation.Each drum has its own volume slider for extra recording flexibility, This is a very collectable piece of music memorabilia from the early 1980s. this drum machine was one of the finest examples of early analog drum machines which ,according to all the forums, gets 10/10 for everything and still holds its own in modern recording studios today. If your not convinced try reading the reviews on line! HAPPY XMAS from the DruMachineBoy! OK so we thought what shall we do to wish DruMachineBoy readers a Happy Xmas, so we got the girls in the office rounded up and took some photo's to sweaten your day, they turned out ok actually, here's our fave photo....but then we said NO! thats just not right...so then it all became clear...and here it is! a lovely classic vintage Roland...now that really floats our boat!! have a great 2010! As well as going completely (Lady) GaGa at the site of a vintage UniVox beat box DruMachineBoy goes off the scale seeing retro animation especially when its animation of vehicles (Highways!) 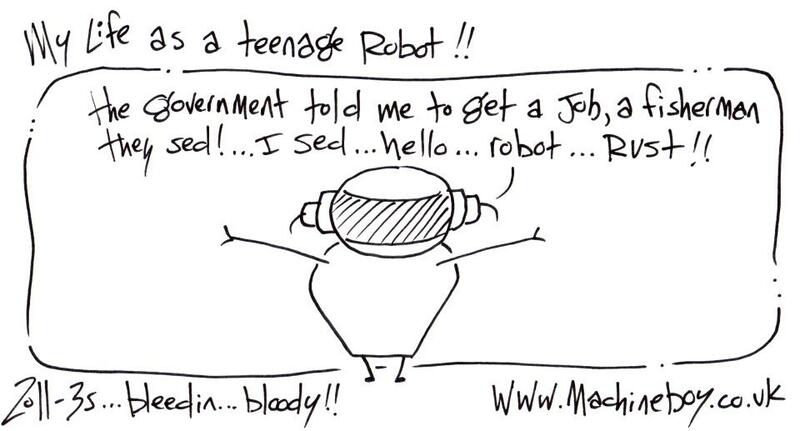 of the future (especially in a Jetsons, Futurama'stylee! )....so yeh ok, we're a bit off topic...but hey bear with us, its worth it!, this is a totally awesome 1958 Disney animated film about highways of the future.....wowza!! CLICK HERE FOR THE FILM YOUTUBE PAGE! CLICK HERE FOR RETROTHING THE PEOPLE WHO TURNED US ONTO THIS FILM! 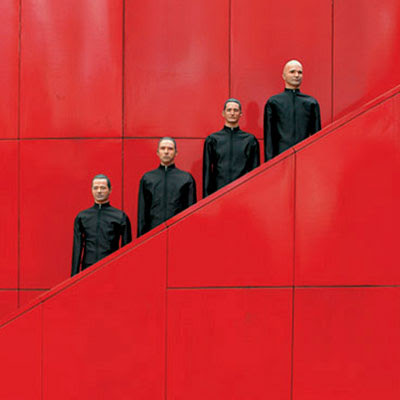 Top notch BBC audio Kraftwerk documentary, awesome! CLICK HERE FOR MORE INFO & LISTEN! KRAFTWERK stage & studio set ups! Brilliant Kraftwerk fan website, showing lotsa images & info about the mighty Kraftwerk's stage & studio set ups thru the years. 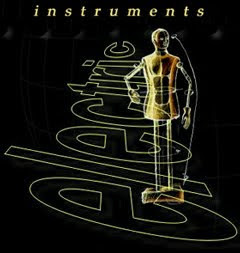 loadsa neat images of classic drum machines & synths...top site! Up for sale is my Jomox XBase 09. This drum machine is in as new condition. It looks like it just left the factory!! 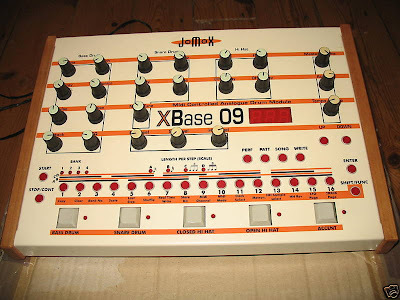 The XBase-09 is serious about emulating the Roland TR-909. Like the 909, it is an analog drum machine, and it sounds just like the 909, and more! It offers the same types of analog controls that the TR-808 and TR-909 did such as tuning, level, decay, snap, etc. However it provides more of these controls for more sounds than the originals ever did and has MIDI implementation and Patch memory making the XBase-09 a much more versatile machine than those originals. Kick and snare are true analog, not emulation and not sampled. The Hihats, cymbal, ride, rimshot, claps and noise sounds are samples but are still quite tweakable. All your edited sounds can be stored into the 100 patches of memory. Use the built-in LFOs to modulate the Bass drum pitch, Snare Tune, Snare Snap, Snare Noise Tune, HiHat Tune or LFO 2. The XBase-09's built-in sequencer is also more advanced yet faithful to the style of its mentors. Step or Real-Time programming just like it's done on the 909 and 808! However, on the XBase, any edits to the sounds will also be stored with the pattern or song! This really liven's up your beats and allows you freedom and control to do things not easily possible on the original beat boxes! There's also an extensive Shuffle mode. Of course the XBase-09 is also happy as a simple drum tone module, with all editable controls accessible using MIDI. The controls also send MIDI data when tweaked so you can record real-time edits into your external sequencer. If you're looking for the TR-909 that should have been, here it is! Authentic sounds with more functionality and modern MIDI specs make this the perfect 909 for the 90's and beyond. Its only limitations are 3 voice polyphony and it's expensive. The AirBase-99 is a cheaper rack-mount alternative with added Toms. 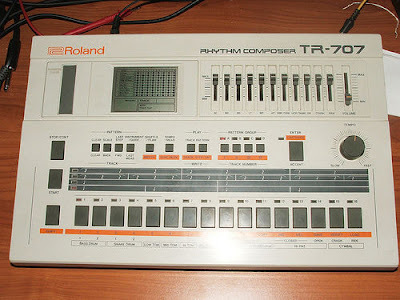 ROLAND Rhythm TR77 Analogue...for sale! Roland TR-77 Analogue Drum Machine. Its in great working order and good condition considering its nearly 40 years old!! Here is a write up i found online. Anyhow, time for a little history... The Rhythm-77 (TR-77) was the product that launched the Roland Corp. in 1972 and was the flagship of the Rhythm trio, which included the R-33 and R-55. Its place in history is secured as the first Roland drum machine ever made. It was Ikutaro Kakehashi's baby which he used to introduce the world to ROLAND after he sold off Ace Tone and moved on to bigger things. 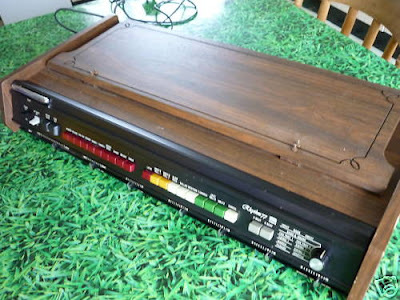 The Rhythm-77 (TR-77) came in two versions, the more common organ style wooden case with built in music stand and a black tolex "roadie protected" (TR-77V). Incidentally, if you don't already know TR stood for Transistor Rhythm. It had separate faders for the Kick, Snare, Guiro and Hi-Hat/Cymbal/Maracas, making it a very flexible machine in the studio. As with many early drum machines you could get more out of them by selecting multiple rhythms and layering them over each other. Sonically, the 77 is probably the warmest sounding of all Roland's analogue beat boxes (before or since). The kick does lack punch but more than made up for that in bass content and the percussion sounds are very nice indeed. The standout sound has to be the guiro pattern which you can fade in over the top of the Cha-Cha and Mambo rhythms. Unashamedly "lounge" and instantly recognisable. The preview demo, (below) re-creates some of the TR-77's most well known recorded moments. Initially, you hear a combination of Cha-Cha & Baion (Ultravox's "Hiroshima Mon Amour"). As it plays, the guiro is faded up, then the Hi-Hat, and finally it drops down to just the snare and kick on Foxtrot 1. There we added some vintage spring reverb and an EH Electric Mistress pedal to recreate Gary Numan's "I Nearly Married a Human" from Replicas. You can spot the R-77 on quite a few tracks from the late '70s. It was quite popular for a few years until the CompuRhythm range took over. Gary Numan used it briefly on the "Replicas" album before moving on to the CR-78. Ultravox (with John Foxx) also used a 77 first before Foxx immortalised the CR-78 on his seminal "Metamatic" album. The 77 is also heard quite prominently in the intro to Squeeze's "Take Me I'm Yours" and "Girls On Film" by Duran Duran. CLIK HERE TO BID ON THIS ITEM! BOSS DR 220E vintage...for sale! CHEAP! HERES A REVIEW BY SOME GUY !!! This is no toy. It's a well specified, reliable, well made, easy to use little drummer. It runs on batteries and often comes with a silver padded case. Henk has totally got it wrong as I'm sure everyone realises. A TR505 and DDD-1?? ?...give me strength! The HR-16 was made by Alesis, so like me, I doubt there are any fully working examples about! Everything was 12 bit in those days..it doesn't sound weak or powerless(?). Boss made 2 versions...the A and E. Both are great little units. One is electric drums, the other acoustic. The sound is strong, Roland stuff. Tis is a better prospect than the 606 which is unreliable, limited and actually quite difficult to use. Also, that unit's claim to fame is that it looks like a 303! 30usd is sooo' 2003. The 220 has been collected, so expect to pay quite a bit for a good example. The few I've repaired have been water damaged. I tend to buy the totally-broken units I've had to skavvy for spares. The pads and switches are very reliable, unlike most Roland switches of the time. You can plug in a set of phones and compose great drum patterns whilst stuck on the bus/tube. Try doing that on a 909! CHEAP AS HELL WITH BUY IT NOW! 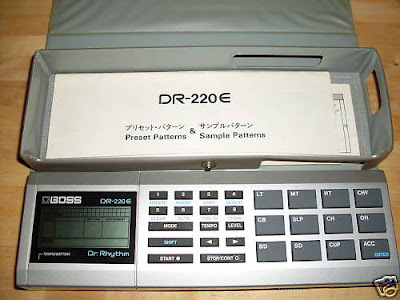 Roland Boss Dr-220E Dr.Rhythm drum machine. Not been used for years, put some batteries in & seems OK. It's seen lots of use so it's covered in scratches & wear marks but the case is intact with no cracks. All the buttons & the LCD display work. It's powered by 4 x AA batteries (not supplied) or an external 9Vdc psu (again not supplied). Thanks for looking. KORG KPR77 vintage analog...for sale! A total classic up for grab from ebay! We're unboxing "Der Katalog" (The Catalogue) - the long awaited 8 CD box set from Kraftwerk. It's an amazing set. A must have for all Kraftwerk fans. Go get it!....YOU KNOW YOU WANT IT! CLICK HERE TO BUY FROM THE HUT! ROLAND SH101 & TR808 Jam! vintage synth demo by RetroSound, bassline: Roland SH-101, internal sequencer is triggered by the TR-808, drums: Roland TR-808, fx: reverb (lexicon mpx); delay (electro harmonix memory man deluxe). CLICK HERE FOR RETROSOUNDS WEBSITE! 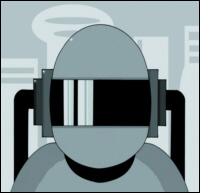 CLICK HERE FOR RETROSOUNDS MYSPACE! one day visco space drum...one day!! 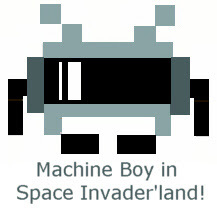 ©2008/10 DruMachineBoy™ - Just to be sure, we scour the t'internet for drum machine stuff, so all our info has come from somewhere, so yeh you too can nick info from our page, obviously if you can give us a DruMachineBoy link back, we would totally love you and probably kiss you all over on our first meeting! thanx DruMachineHeads!